How Do You Make an Engraved Sign? Our customers often confuse the terminology we use and it’s no wonder, there are so many different types of signs. To them what matters is that they are getting the product they want. Engraved signs are a good example of this as they are often confused with Carved signs. Engraving is a similar process to carving, but on a smaller scale and with much thinner, lighter weight materials. Inside versus Outside – Where are Engraved Signs Used? Engraving is a process where either a rotorary style routing machine or laser engraver is used to engrave lettering, logos or even pictures into thin materials such as plastics, brass, aluminum, etc. The engraving is about 1/64″ deep in the material. There are many premade plastics in two colors that are used for engraving. This allows for a two color sign simply by removing the top layer and exposing the bottom layer. These plastic materials are for interior only or interior and exterior use. 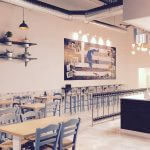 The color combinations offer a wide variety including metal finishes, wood grains, marbles and a wide range of color combinations. Romark is a brand of engraving plastics we use. There are other vendors, but Romark offers the widest selection of colors and materials for engraved signs for both indoor and outdoor use. What Are Engraved Signs Used For? Engraved signs have many uses. Most often, we are making office nameplates when making engraved signs. 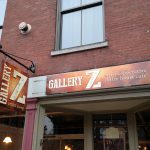 Generally, these signs are 6-12″ wide and 1-4″ tall. 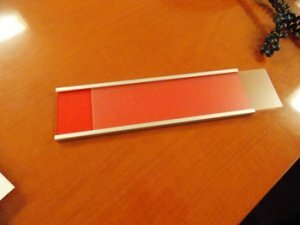 We offer holders in metal colors for these nameplates which can be attached to a wall or cubical to identify offices, utility rooms, restrooms and other rooms. Sometimes customers don’t want to engrave the nameplates as the offices or users change frequently. In this case, we offer custom slide in signs like the one below. 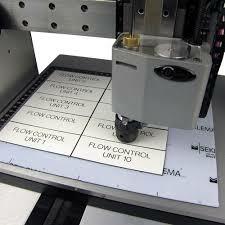 The customer can print paper signs and insert them into the nameplate saving time and money when new signs are needed. 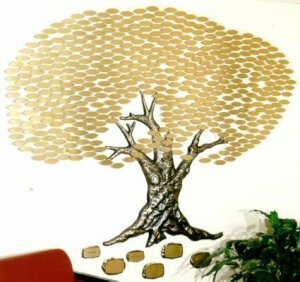 Many Donor Walls are made up of brass or bronze engraved shapes to identify donors. There are attractive Donor Trees which use engraving to ensure that the information on the signs is long lasting. 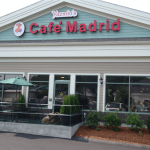 Matthews Architectural Products offers a number of designs for this use. We are a Matthews distributor and can happily price up one of their designs, or custom design a Donor Wall for you. What is the Difference Between Etching and Engraving? Both etching and engraving are similar processes, however, etching allows for fine details and even photos to be engraved in materials such as brass, bronze, aluminum, stainless steel, and plastics. 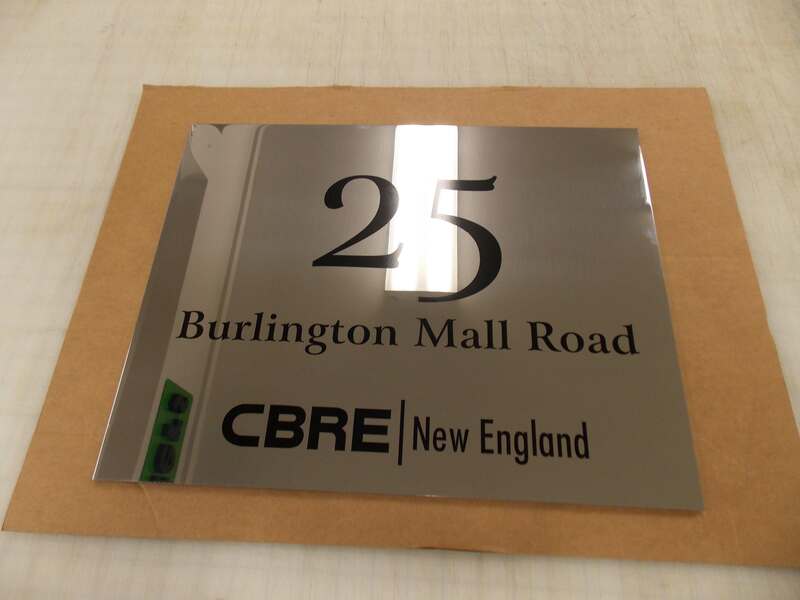 The sign below is an example of an etched sign on polished stainless steel. This is an outdoor sign for building identification and will hold up to the elements for many years. Gemini is one of the manufacturers we use for this process. They offer many options and solutions for your needs. How Do I Buy Engraved Signs? First, we identify the use for the sign; Room Identification, Building Identification, Directory, Donor Wall, Pipe Marker, etc. Next, we deterimine where the signs will be hung; interior or exterior. And finally, what hanging hardware or method would you prefer; pins for cubicals, double tape, screws, etc. From here, we design the sign(s) for you and provide you with proofs and pricing to review. 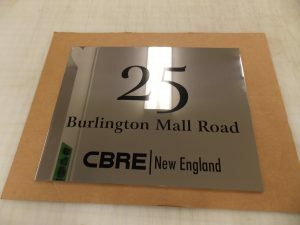 Turnaround time for engraved signs is 1-3 weeks depending on the material selected, number of signs and engraving methods used. We also offer installation services for you to be sure your signs are hung level and correctly. Need more information on Engraved Signs? Give us a call or stop by our showroom to see examples, color charts and material options.